Lightweight - Weighs less than 1 lb.! The product does a great job cutting many things, but can easily choke on two layers of cardboard if it's tilted sideways by a bit. When it doesn't cut, often the blade is a fraction of an inch away from what needs cutting, and it's a feed problem. Keeping it straight helps a lot on thick things, and sometimes, angling the front downwards slightly can get it to bite and go smoothly. If you are not feeding it something at maximum thickness, and are keeping it straight, it does a fine job. As for the safety switch, the tool is designed so that if you grab it with one hand, chances are the switch will be a bit forward of where your thumb is likely to end up. You will be a lot less likely to turn it on by mistake while grabbing it, but the trade off is that the button feels a bit forward of where you might expect it. But it's hardly a chore and stretching your thumb forward a fraction of an inch is all it takes. The safety switch can be pressed from either side, so you can use it with your left or right hand. But if you use your left hand, you can't see the blade area and are more likely to have problems keeping the tool at the correct angle. If you are left handed, it won't be the ideal tool. it needs more power , I would like to see this tool with at least 14 volts or 18 volts. I had been looking for a tool that would cut carpet and padding without damaging my hands. The Skil Multi-cutter totally fits the bill. It cut through my old carpet like butter, allowing me to remove the pad and carpet in a 14x10 room in small managable load in less than 2 hours. It holds a charge for more than 2 weeks when not in use and had plenty of power to go after the initial 2 hour use. It requires no maintenance and is solidly built to last. This product easily deservers 5 stars. 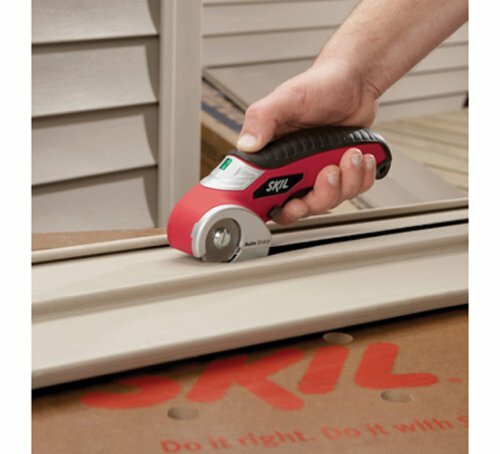 I purchased the Skil Multi-Cutter to help breakdown cardboard boxes for recycling. I had been using a box cutter but always risked cutting too deep into my carpet or slipping and cutting my leg. With the Skil, the risk is gone. It cuts quickly, maintains its charge for a long time, is safe and fun to use. Just hang it on a hook at a convenient location - you'll use it frequently. I don't rave about tools, but this was a great purchase! This is a real fun tool. It is perfect for slicing into hard-to-open plastic packaging, and powerful enough to cut through quarter inch rug pads. 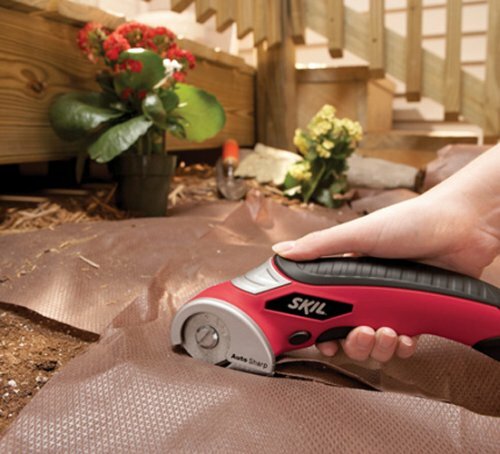 Like a couple of other new Skil tools, its lithium battery holds a charge for several months. The product is compact and easily gripped in either hand. I originally bought this to cut up boxes for recycling and the multi-cutter does a great job with that. I already owned Black and Decker Electric Scissors and found them too limited although they are advertised to cut many of the same materials that the Skil Multi-Cutter Skil 2352-01 3.6-Volt Lithium-Ion Multi-Cutter is advertised for. 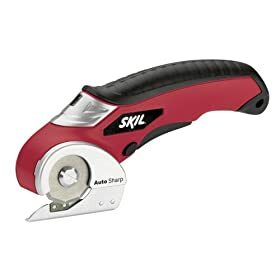 The Skil is not a fast miniature circular blade like I had expected, but don't let the slower speed fool you. 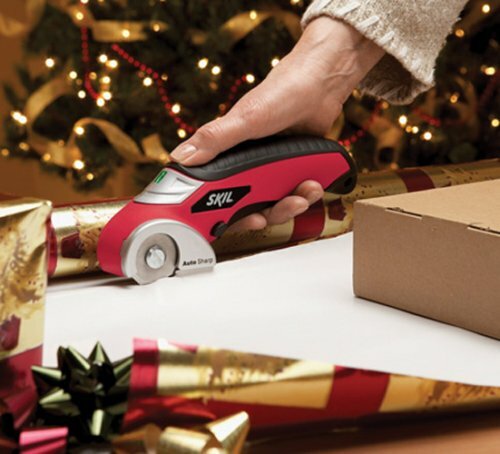 This cutter cuts open plastic packaging, reduces all but the very thickest cardboard boxes to easily recycled hunks, trims the bottoms of vinyl vertical blinds evenly and without rough cut marks as are left by the Black and Decker scissorsBlack & Decker SZ360 3.6-Volt Ni-Cad Cordless Power Scissors. One reviewer expressed disatisfaction with their use of the multi-cutter on fabric, so I had figured they wouldn't work well for that. Well, today I thought, "Why not?" and was overjoyed to discover they excel in cutting out cloth. The fabric I was using was a heavier cotton with a crinkle texture. It has always been a pain to cut with regular scissors and the Black and Decker electric scissors wouldn't cut 3 inches without stopping from fabric stuck between the blades (where it would then eat up the edge of the fabric!) The Skil cutter powered through the material like a hot knife through butter and was easy to maneuver around both inside curves and outside curvers. The blade design allow cutting even close to pins. So, now I'm ordering a second multi-cutter. Then I'll have one for around-the-house tasks and one dedicated to fabric cutting for sewing. The Lithium-Ion battery means they are ready to go when I am, not always needing charging like the Black and Decker scissors, which are Ni-Cad. 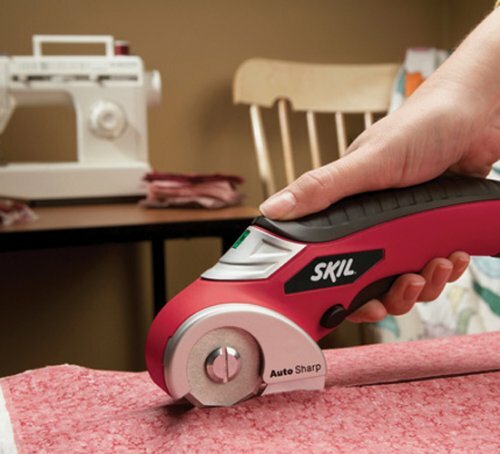 Bottom Line: Skip the B&D Electric Scissors and buy the Skil multi-cutter. It is truly worth the cost difference. I bought this tool anticipating some work with indoor/outdoor carpet, as task I learned for which it was well-suited. Then I had to make some gutter repairs, and it cut though light sheet metal like a hot (warm?) knife through butter. Then I got another tool that came in one of those d@@m sealed plastic clam-shells. The Skil let me open it in about 10 (safe) second. The blade rotates with a lot of torque and at relatively slow speed which enhances cutting power and control. The only minor problem I have encouterd is that when cutting sheet metal bent at 90-degrees, the long "nose" would not let me get as close to the seam as I would have liked. In short, I may not use it every day (although sometime I walk around looking for something to cut!) but I am delighted it's part of my tool colection as it has and will make certain jobs much easier and more precise. UPDATE, 3/15/09: Went to use the tool yesterday on material I had cut before and it would not work. The battery was fully charged, and when I pulled the trigger the blade would turn UNTIL it encountered the edge of the material (tried light cardboard, tin, plastic clam-shell, etc.) The motor kept running but the blade stopped cold. (Yes, I checked the manual and made sure the screw that attaches the blade was tightly in, and it was.) I contacted Amazon and they were very courteous but reminded me that for a a full refund or exchange I would have needed to do this in the first 30 days. 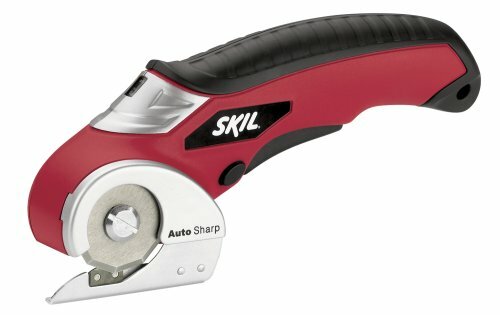 Contacted Skil customer service and they said they had never had a problem with one, told me to ship it back to them, and they'd repair it and send it back. I, of course, had to pay $8.85 for shipping/insurance, thus wiping out any benefit in buying from Amazon as opposed to one of our local "big boxes" which accepts defective merchandise for 90 days. I'll update this when I hear from Skil. Going on six months now with this tool. There is NOTHING better for cutting open those infuriating packages encased in that impenetrable plastic. The battery lasts a VERY long time--just recharged after infrequent use over the past four months. It may not cut everything but for me, it is well worth the reduced price at Amazon (now less than $50) simply for the packages it opens. I was expecting the ergonomics of this to be similar to the ergonomics of the Skil cordless screw driver, which is a pleasure to handle - this is not. This was tiring just to experiment with. It is very unbalanced from left to right, you have to hold it "up" horizontally. It is not well balanced from front to back either, so you are working to keep it just so. I had a hard time controlling it to keep on a straight run. If you have small hands, you need 2 hands to get it out of safety mode as your thumb will not reach the safety latch and the go trigger at the same time - perfect if you are worried about kids getting to it. This is a man's rough cutter for straight runs, perhaps. For the average woman to use for fabric, wrapping paper, drawer lining - not at all. Sending it back. Not quite sure why a refurbed unit is over 90.00 dollars? Got this tool for my father for fathers day. He loves it and was very excited about it. I bought this to cut up hundreds of yards of carpet and padding. It worked just great. Also cut through some plastic packaging, etc. It has been quite durable and done exactly what I needed it to do.